Genetically modified organisms (GMOs) have had specific changes introduced into their DNA by genetically engineering techniques. This technology is thought to increase food yields and create super foods that grow larger and are more resilient to pests. 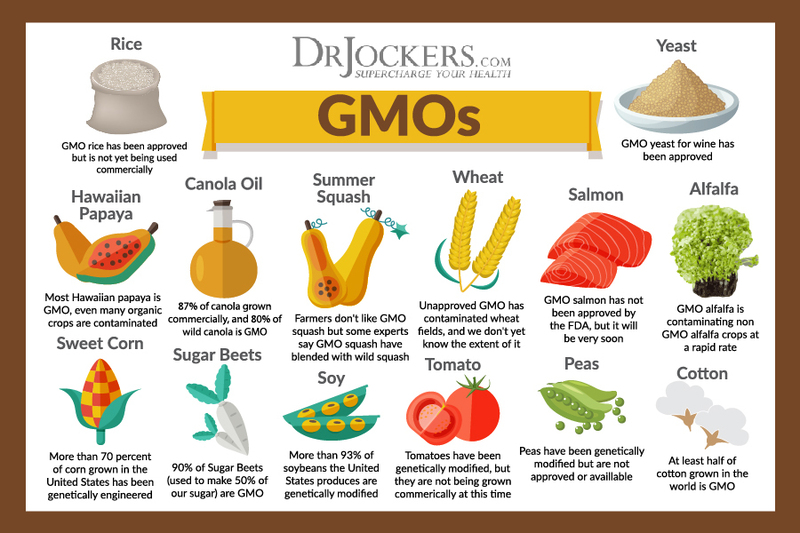 In this article, you will discover 7 simple ways to avoid GMOs. Despite mounting evidence, the FDA and food industry continue to say GM foods are safe, tested and necessary to feed a world dying of starvation (1). After many years of research on risk/benefit of GMO products, it is now quite obvious that they pose an extremely significant hazard to human health (2, 3, 4, 5). There are critical steps a consumer can take to avoid consuming GMO foods. One of the most popular genetic crop modifications makes plants immune to herbicides. In particular, the company called Monsanto has made a whole line of “RoundUp Ready,” crops that are resistant to the RoundUp herbicide. However, the natural world is far superior than man’s attempt to manipulate and control nature. Fields that have been sprayed with RoundUp for multiple years are now seeing super weeds that are impervious to RoundUP and grow up to six to seven feet tall (6). Andrew Kimbrell is the Executive Director of the Center for Food Safety since 1997. He says that we now have 10-20 million acres of these super weeds that you cannot kill (7). The RoundUp herbicide is also a powerful toxin for human consumption. GM products are highly sprayed with such herbicides and many strong pesticides. These toxins cause serious damage within the human body. Unlike many other countries, GMO containing foods are still unlabeled here in America. However, according to a recent survey, 93% of US citizens believe they should be labeled (8). Currently 60-70% of our food in the US is genetically modified. Children’s foods are the number one GMO containing products (9). Many processed foods contain 90-100% GM ingredients. Most all non-organic breads and other baked goods contain GM ingredients. Most non-organic chocolate, sweets, candy, gum, etc. contain GM ingredients. Most non-organically raised animal (meat, dairy, eggs) products contain GM ingredients. These animals are typically fed a diet that is 90+% GMOs. Most non-organic beverages (beer, wine, soft drinks, juices) contain GM ingredients. In May of 2009, The American Academy of Environmental Medicine (AAEM) sent out a press release that called for an immediate moratorium on GM foods (10). They asked physicians to educate their patients and provide educational material about the health risks associated with GM foods. They proposed that physicians consider the role of GM foods in their patients’ disease process. In their position paper, the AAEM sites several animal studies that indicate extreme health risks associated with GM foods. Some of the health risks include infertility, immune dysfunction, allergic reactions, accelerated aging, insulin dysregulation, organ malfunction and digestive dysfunction (11). The AAEM quoted in their paper, “There is more than a casual association between GM foods and adverse health effects. There is causation, as defined by recognized scientific criteria. The strength of association and consistency between GM foods and disease is confirmed in several animal studies” (11). 1. Buy Organic as Much as Possible: Many people struggle to afford organic products but it is very important for your health and the health of the planet. You can begin with all of your meat products as non-organic animals are typically fed GMO corn and soy and so they bioaccumulte the glyphosate toxin in their system. 2. Buy Foods Labeled “Non-GMO”: Foods that have gone through the process of being labeled “Non-GMO verified” have had a 3rd party inspect their farms and processing plants to ensure that nothing with GMO’s is involved in the processing of their food products. We want to support companies that are doing this for our own health and to continue to incentivize this level of manufacturer transparency. 3. Avoid Non-Organic GMO Containing Products: Avoid non-organic products containing corn, soy, canola, cottonseed, peanut, alfalfa, safflower, tomatoes, zucchini, crookneck squash, sugar cane, beats, peppers & papayas. If the produce or products with these ingredients are not labeled organic or “non-GMO,” than there is a very high likelihood they are GMO, so you will want to avoid them. 4. Avoid GMO Offspring Products: Avoid GMO offspring products such as high fructose corn syrup, maltodextrin, soy flour, corn oil, soy protein, etc. 5. Avoid Non-Organic Animal Products: Avoid non-organic dairy products and all other commercialized animal products. As described above, non-organic animals are most commonly fed GMO corn and soy and thus bioaccumulate the herbicide toxins from these plants in their meat and dairy. 6. Grow Your Own or Buy Local: Grow your own food products or purchase them from local farmers who do not use GM seeds & products in their farms. 7. Non-GMO Shopping Guide: Use the Non-GMO shopping guide here to help ensure you aren’t getting hidden GMO’s in your food choices. There is a revolution happening in the farm fields and on the dinner tables of America, a revolution that is transforming the very nature of the food we eat. The movie, “The Future of Food,” offers an in-depth investigation into the disturbing truth behind the unlabeled, patented, genetically engineered foods that have quietly filled the grocery store shelves for the past decade. These Genetically Modified Foods (GMOs) were engineered by big chemical companies such as Monsanto, Dupont, Bayer, and many others. These companies are linked to a multitude of crimes on humanity and now they are looking to control our food supply. Currently, 60-70% of our current food supply contains GMOs. Children’s foods are the number one GMO containing products. When animals are offered a choice between a GMO and a non-GMO food, the animals always choose the non-GMO food. Many times they will do this to the point of starvation, as they have an intuitive sense of the danger of this food. It’s important to realize that the key to ending the ongoing atrocity of GM foods lies not with government, but with you and me. Consumers are going to have to drive GM foods out and we CAN do it. Through educating yourself, your family, friends and community about GMOs, and most importantly of all, through the food purchases you make, you can stop this unregulated science experiment. Once we reach the tipping point, which is probably as little as five percent of the US population, the market WILL respond. They can’t afford not to! Once enough people refuse to buy GM food products, it won’t be long before food manufacturers start switching their ingredients. The reach of the average person. The rich oppress the poor of the world. I agree with you Norm! As customer demand goes up, we will likely see an increase in organic farm practices and a drop in prices. Our choices have a lot of power! It’s TRUE, organic & non-GMO foods are ridiculously expensive. Great profit incentives to have it labelled organic & triple your sales price. I’s AMAZING how growing our own food… even if only SOME in a patio or containers, even out of a bag of soil…. We don’t need large yards to grow our own… and it’s NOT difficult, and it IT rewarding (savings of money are quickly noticed, and the conscious KNOWING that your own crop is not laden with sprayed on poisons or modified to have who knows what effect on our bodies…. PLANT ONE PLANT in a pot & BEGIN to break away from these killer companies. Great point Rick! The best way to make sure you are getting the freshest and cleanest food is to produce it yourself. Yes, I agree the best way is to grow it ourselves. However, I’m always concerned with what kind of soil to purchase in order to have a safe non toxic growing environment for the seedlings. How to buy NON GMO without buying organinc? Yes look for that Non-GMO verified sticker.